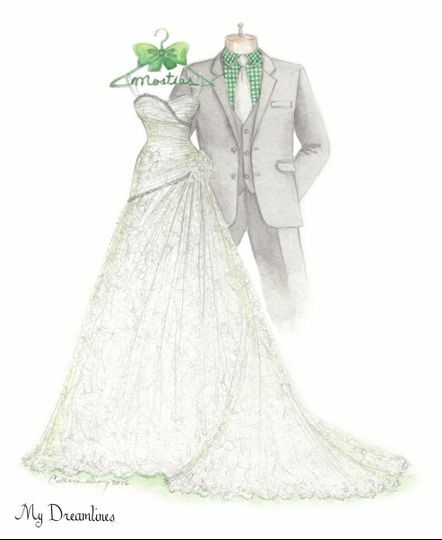 Dreamlines Personalized Wedding Dress Sketch is a highly-rated wedding favor company located in O'Fallon, Missouri that services weddings throughout the nation and globe. 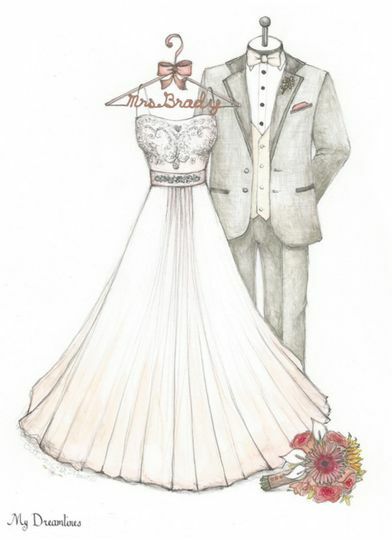 The company has nearly a decade of experience providing personalized sketches of brides' wedding dresses. 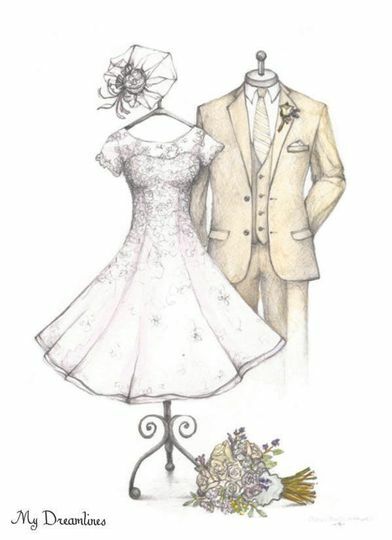 These sketches are perfect gifts from the significant other, a family member or a friend. 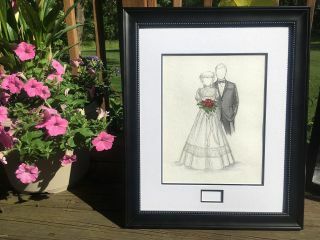 They also can be placed at the reception for guests to see, and guests can sign the mat border around the frame to create a unique, lasting guestbook. 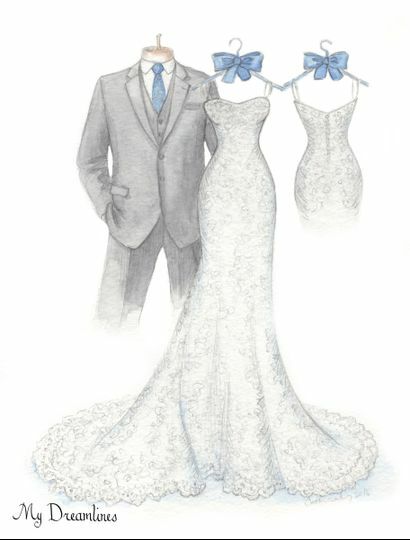 Dreamlines Personalized Wedding Dress Sketch offers custom, personalized sketches of the couple's wedding attire. The design and printing are handled directly by the company and express shipping is also offered. This gift can be included on a registry. The average turnaround time for this product is typically one week. Dreamlines wedding gift from the groom to the bride. 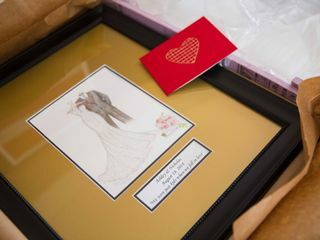 Her wedding dress sketched and framed. 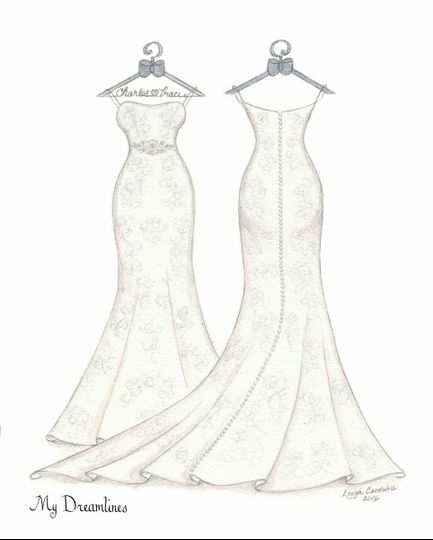 Valentine&apos;s Day gift can be her wedding dress sketched and framed. 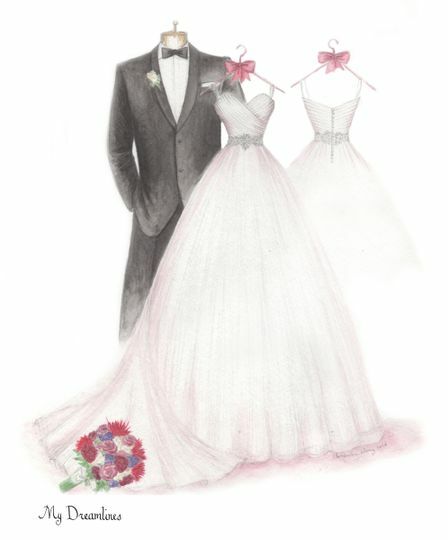 Wedding gifts from groom to bride is a lovely wedding day gift to give to your new wife. 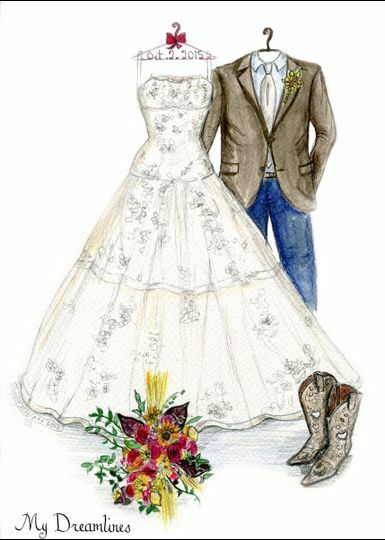 Wedding day gift from the husband to the wife is a perfect wedding gift. 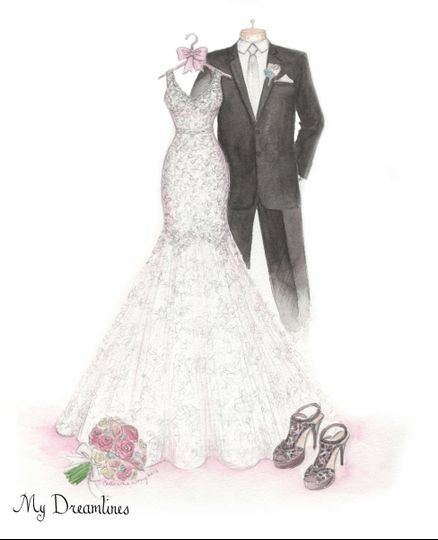 My husband gave me a sketch of my dress, his suit and our dog. It was the best gift he has ever given me. I was so surprised and blown away. I completely ruined my make up. I highly recommend to be given this before the makeup goes on. :-) Also he had an easel at the reception when we walked in where he had it displayed next to our guest book. He really went above and beyond and I can't be any happier with him or the gift. Michelle I am so happy to know you love your sketch so much. Thank you for sharing your day with us. We are just so happy to be a part of it. This is the greatest gift. My wife was blown away. 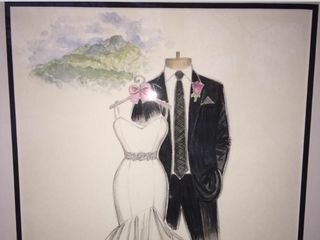 We have it hung up along with our wedding photos. Your artist did an amazing job. Thank you so much. Thank you for sharing your kind words Greg! I am so happy the sketch was such a hit and you both loved it. 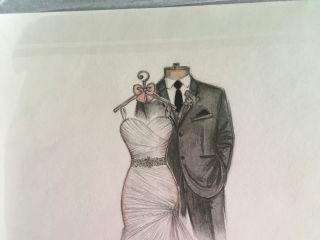 I had a sketch commissioned by Dreamlines to give to my wife on our wedding day. It was astounding. She was was beyond happy. I am so happy I found you. Thank you again for the amazing detail and something my wife will love forever. Thank you so much for sharing Marcus! 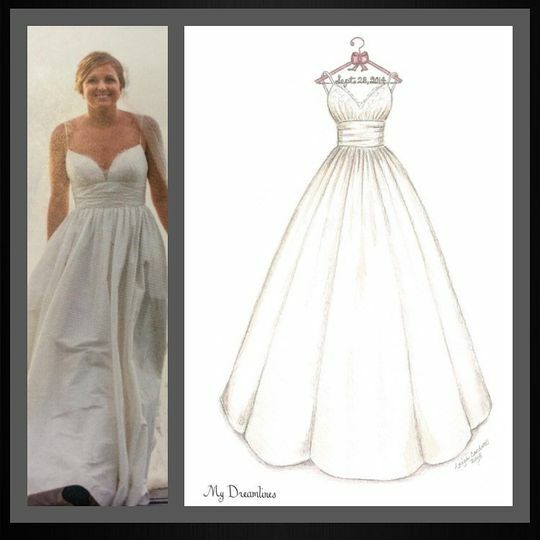 I am so happy your wife loved it so much! 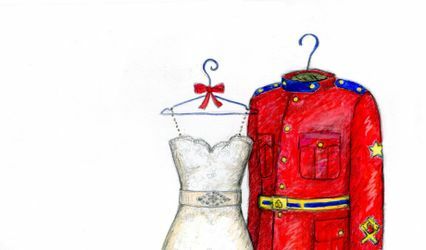 If you have or are serving in the military we will offer a free bouquet sketch with a wedding dress sketch order.